Want to set a reminder to book an Uber ride? Or pay via PayPal over email? Outlook can help. 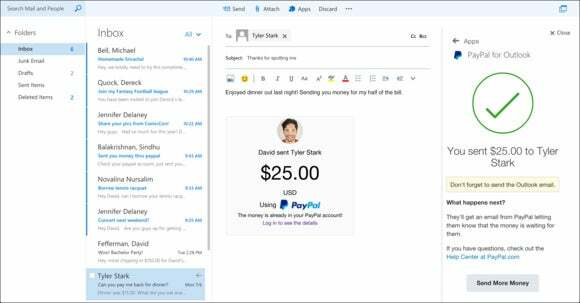 Microsoft announced a number of Outlook “add-ins” on Wednesday, including ones for Uber and PayPal. This is all part of the company's efforts to develop Outlook as a platform for other services. The company also outlined a roadmap to add IFTTT (If Then, Then That) integration in a future release. Microsoft tipped off that these add-ins were coming a short time ago. The new add-ins are rolling out via Outlook.com and, more importantly, via Office 2013 as well. You’ll need an Office 365 subscription to take advantage of them, though. Microsoft has opened its Microsoft Office apps as a foundation for other services to run on top of them, although it uses slightly different terminology to describe what they can do. Microsoft offers free and paid plug-ins via its Office Store, which add functionality to Office apps. The Uber integration, however, is an example of what Microsoft calls an add-in, which essentially connects Outlook to a third-party service. You can now schedule and order up a ride from Uber within Outlook. Microsoft launched four add-ins on Wednesday, connecting Outlook to Evernote and the email scheduling service Boomerang, as well as Uber and PayPal. With Uber, for example, you can set a reminder within Outlook to order up a car, then swipe the reminder when it pops up to do so. Likewise, you can use PayPal to send an email with virtual money attached (a capability Gmail has offered with its own payments service for some time). You can also share a note with Evernote, or share your calendar via Boomerang. What’s nice is that IFTTT support is apparently around the corner, allowing all sorts of additional “recipes” for getting things done. Yelp support as well as Wunderlist is also on the way, Microsoft said. Why this matters: Numerous apps can connect to your email account—Microsoft’s own Mail apps can manage Gmail, and an Android mail app can connect to your Exchange or Hotmail account. By tying in value-added capabilities into Office 2013 and Outlook.com, however, Microsoft makes these products more valuable.